Oh boy, this is BIG! 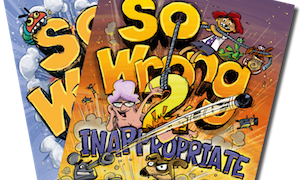 Along with my new book, So Wrong, I’ve been secretly working with my friend, Wayne Bryant, on the So Wrong website, which contains its own So Wrong Book Club. Now book clubs might not be your thing, but this one’s different. This is the where you’re guaranteed to be wrong first. That’s the So Wrong promise! And as a member of the So Wrong Book Club you’ll know about stuff like the following before anyone else even has a single clue. and all sorts of other delightful wrongness. Straightaway, as a club member you can pre-order So Wrong without having to pay for postage and handling – that’s a $4 saving from the moment you join. So if you don’t like book clubs, but you do like wrongness, come and join the So Wrong Book Club.